Wow, that is really innovative. Deserving of an award, really. I'm impressed! Add that with, SNapter. Or just use snapter. It would faster and cheaper. Much faster. my requirements were different as I didn't mind destroying the book in the process. I removed the spine then stuck the pages in an inkjet printer's tray. I then removed the exit tray for the printer and positioned it so the pages would fall onto a flatbed printer. 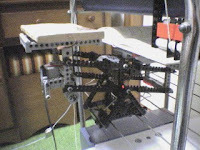 I programmed the computer to print a blank page, moving the sheet onto the scanner, then scan the page, and finally my LEGO nxt robot used a wheel to discard the pages into the exit bay. THen the process would repeat.